Interstate Specialty Products uses both digital and rotary die cutting equipment to perform kiss cutting, a cutting process that makes precise cuts into a material without penetrating the release liner or backer. 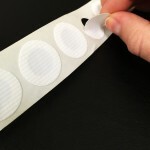 Kiss cutting is ideal for gaskets with a pressure-sensitive adhesive (PSA) liner or backing, and produces “peel and stick” parts that are ready-to-install. Applications for kiss cutting include membrane filters, vents, and gaskets. Kiss cutting with digital equipment creates gaskets that are easy to ship, distribute, and assemble. Unlike die cut gaskets that are cut-through individually, kiss-cut parts are supplied on sheets or rolls. This supports material handling and production throughput. 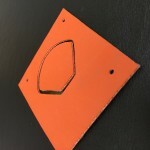 Instead of carefully removing the release liner from an individually die cut part, an installer can simply “peel and stick” a kiss-cut gasket. Interstate Specialty Products kiss-cuts gaskets made from non-metallic materials. Examples include Mylar, Kapton, Nomex, Poron, and Volara. 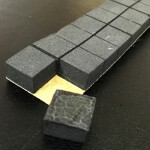 Interstate also uses kiss cutting with digital equipment to convert felt, nonwovens, polyethylene, PTFE membranes, solid elastomers, and sponge and foam materials. Interstate can kiss-cut materials that already have PSA release liners, or apply PSA backings to specific regions of gasket materials. Our laminating capabilities complement our kiss cutting expertise, and support the use of both one-sided and two-sided PSAs. Using rotary converting equipment, Interstate can join separate materials together and then kiss-cut parts to your exact specifications – all in the same machine. 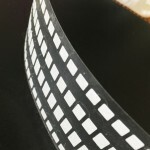 Is kiss cutting the right precision die cutting technique for your membrane filters, acoustic or thermal insulation, or vents? Interstate Specialty Products uses digital equipment to kiss-cut a range of non-metallic materials, and can apply PSAs to support your specific application. To learn more about kiss-cut gaskets from Interstate, contact us on-line or call (800) 984-1811.